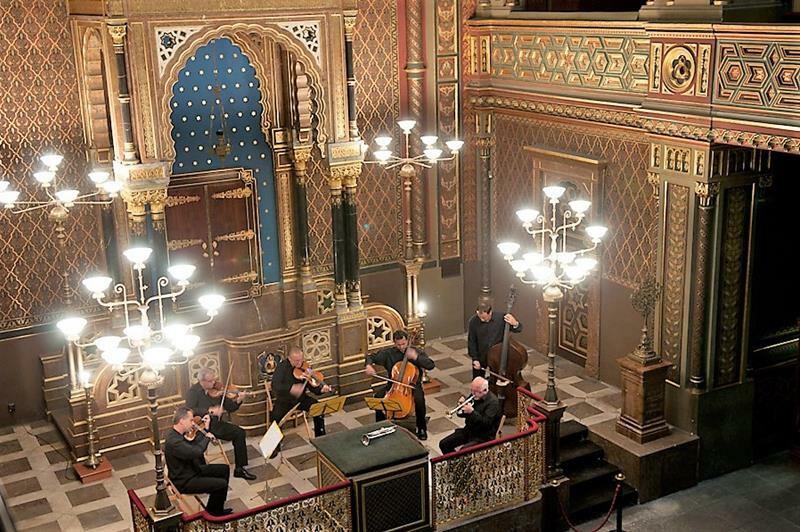 You are invited to chamber concert at splendid premises of Spanish Synagogue. Tonight´s concert features the most famous melodies of G. Gershwin, L. Bernstein and well known musicals. Trumpetist Miroslav Kejmar and renowned Czech Collegium Ensemble will guarantee a great artistic experience. 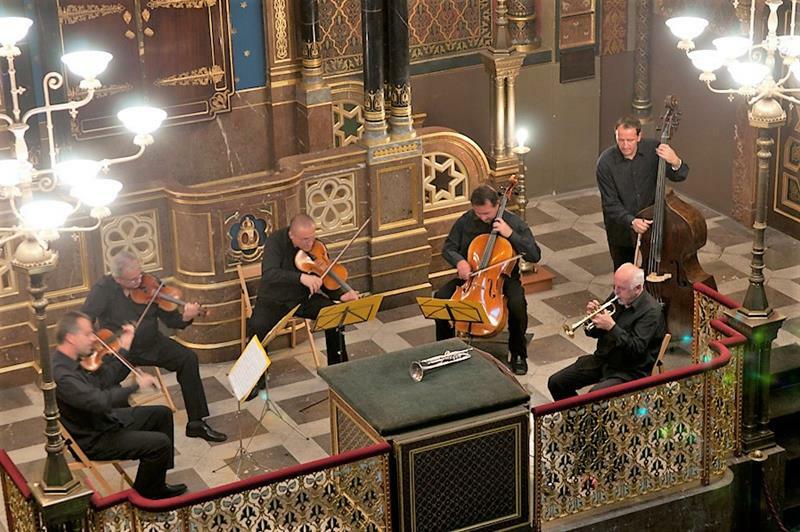 Ensemble Czech Cllegium is a significant music ensemble of Prague music scene. 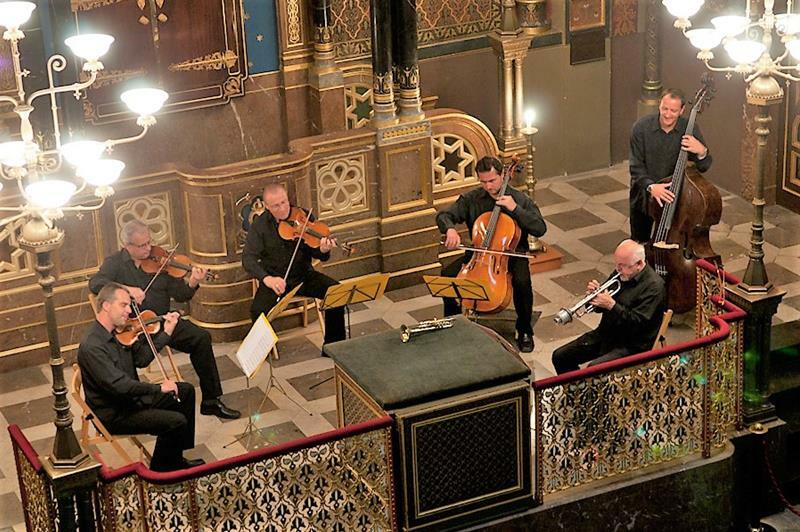 It was founded by members of the Prague Symphony Orchestra and is an essential part of Prague's cultural life. Trumpeter Miroslav Kejmar belongs among the elite Czech players on brass instruments. He is a longtime member of the Czech Philharmonic. The founder and permanent member of the Prague Brass Ensemble. Are you a group of 10 or more people? Take advantage of our group discounts. 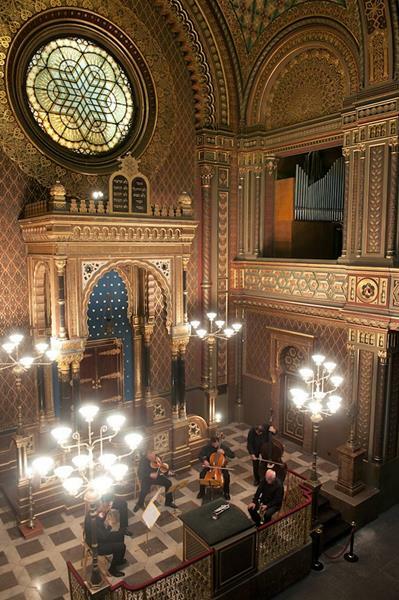 Spanish Synagogue in Prague is one of the most beautiful synagogues in Europe. 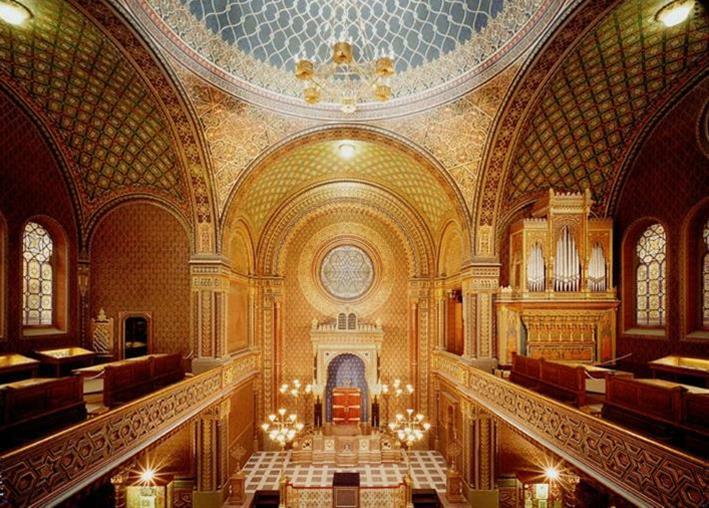 The synagogue got its name from the Moorish style, in which it was in 1868 built on the site of the original synagogue – so called Altschul - from the 12th century. 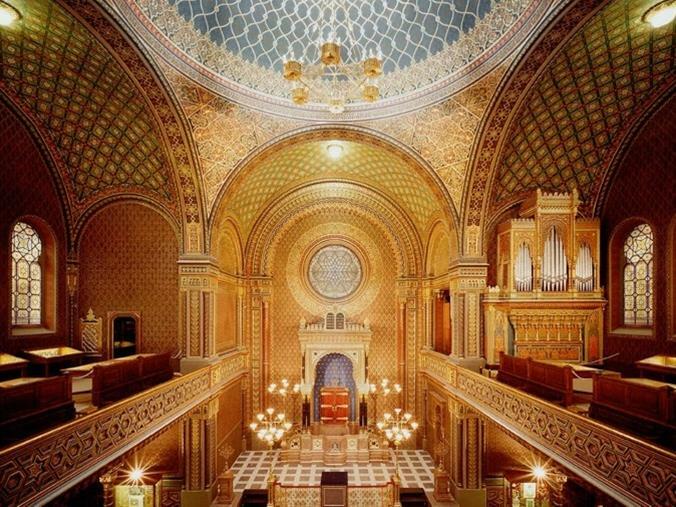 Exotic style, inspired by famous Alhambra, emphasized the reformist character of the new synagogue, which belonged to German-speaking reform Jews. The building was designed by Josef Niklas and Jan Bělský, the remarkable interior by Antonín Baum and Bedřich Münzberger. František Škroup, the composer of the Czech national anthem, served as organist here in 1836-45 (i. e. still in Altshul). 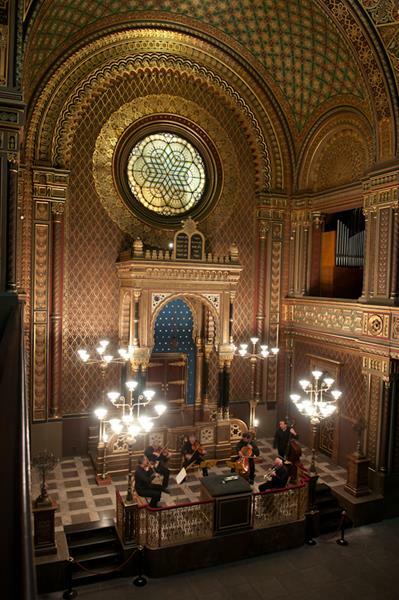 The synagogue now belongs to the Prague´s Jewish Museum, it houses part of the exhibition, and popular concerts of classical and sacred music often take place here. Excellente soirée...qui nous a enchantés. Une expérience musicale de qualité dans un lieu et une atmosphère inoubliables !!! Loved the music of Gershwin and others performed by these talented musicians. The music was wonderful. The performers seemed to enjoy their craft and it reflected upon the audience. The wonderful Gershwin repertoire has been played excellently. I have nothing else to say except: go and take a ticket! Excellent musicians and a very good selection of works! There was no interaction between the musicians and audience except to acknowledge our applause. I wish they would have talked a little about the pieces or at least told us what they were playing? I really enjoyed the very upbeat music performed with great brio and humor though I was slightly surprised to hear a medley of songs from the musical My Fair Lady included in the program. Gershwin did indeed write a musical that was briefly titled My Fair Lady but the songs our quintet treated us to are from a different later musical the music of which was composed by Frederic Loewe. Not that I'm complaining. It's my all time favorite musical. It's just a point of information. Wonderful performance and choice of pieces! Six elements that performed with virtuosity and irony the best songs of Gershwin but also other authors. The best and pleasant evening I spent in Prague! 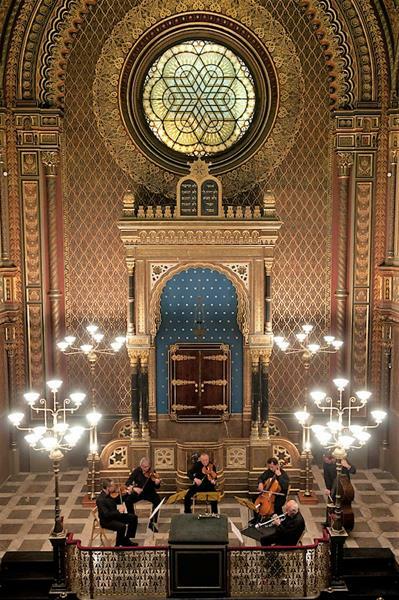 Really enjoyed it, great concert and amazing synagoge. Classical , perhaps more swing. It was the best concert that I ever been.The place,Spanish Sinagogue for itself as a wonderful and impressed and of course,music and very good artists.